These �sandwich� type head gaskets are composed of copper facings either side of an aramid reinforced filler material. 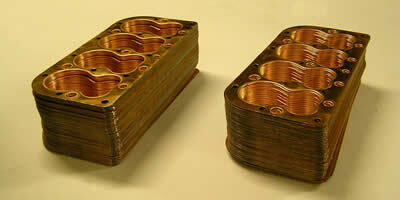 The conformability of the copper coupled with the density of the non-asbestos filler material make it a highly suitable cylinder head gasket for vintage, veteran and classic cars and motorcycles, as well as tractors and stationary engines. In addition to the accuracy of manufacturing tolerances, it is essential that the materials used are of the highest order to ensure an effective and long-lasting seal. Contact us to discuss your requirements for copper head gasket needs.